Had a bank account with monthly fees or charges? If so there is a good chance it was mis-sold? Last week Mrs P got £1266.98 refunded by the Halifax using this guide. So isn't it time you checked if you can claim? This guide explains all the steps you will need to take to check if you can claim. We'll then show you how to get your money back and compensation for it being mis-sold? 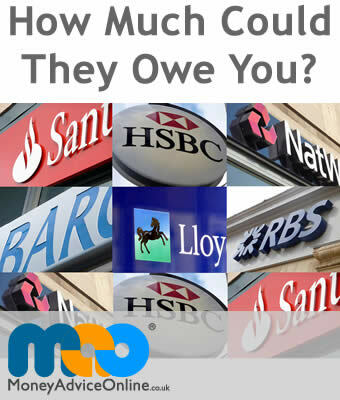 UK banks are braced for £825m bill over mis-sold current accounts as 200 complaints a day now pour into ombudsman. Mis-sold packaged bank accounts are currently the fastest growing area of complaint for the banks. An Estimated 11 million people pay as much as £300 a year, but as many as one in five people may have been mis-sold this type of bank account. A packaged bank account is commonly referred to as a "bank account with extras", or "premium accounts" for which you paid a monthly fee in exchange for extra benefits. If you pay or have in the past paid fixed monthly charges or fees, typically between £5 and £30, in return for additional perks such as break-down cover, travel insurance and phone insurance, it is likely that you have what is known as a ‘packaged bank account’. Many people may be unaware they even have a packaged bank account. If you have not used any of the benefits or did not want them in the first place you may be able to claim your money back. You may even be able to claim even if the account is no longer active. Have you been mis-sold a packaged bank account and could you potentially make a claim? Who bought Packaged Bank Accounts? Around 11 million packaged bank accounts were thought to have been sold in the UK by January 2010 and many people were sold these accounts unwittingly. Many people may be unaware they even have a packaged bank account. In many cases, it wasn’t made clear just how the additional products accompanying the accounts worked, what the insurance cover was for, what customers needed to do or the position that they had to be in to claim. Sometimes customers were even put under pressure to open an account or were provided with inaccurate information making them think that they had to have one in order to qualify for a loan or mortgage. If you have not used any of the benefits or did not want them in the first place you may be able to claim your money back. You may even be able to claim even if the account is no longer active. If you have been miss-sold your packaged bank account, you could be entitled to all of the fee’s that you have paid plus interest. Customer paid £18 a month for 5 years that’s £18 x 60 months or £1080 + 8% compensatory interest.